Rambling Moose: Flap! Flap! Stealth Little Blue Heron Returns! When you are out for three one mile walks a day, you spend a lot of time outdoors. In my case, that's at least an hour in the dark. Some might say that I am in the dark about a lot of things, but this is real. I'm up well before dawn when the only people out are leftovers from the bars and the rest of us dog walkers who got up early before the heat. At night, it's still pleasant out. My pack and I are out walking all over our part of town. That night we're out flapping our jaws at each other and watching my dog pretend he's a rabbit in a Disney Movie. Sweeping left to right at the end of a six foot long, stout, purple leash, Rack bounces from place to place. He's a dog that would benefit if I were to take him for a run next to the bicycle or on my inline skates. Since he's afraid of his own shadow, that simply won't happen. New is Weird. Weird is Weird. Weird is to be avoided by flattening out on the pavement or hiding behind me. Actually, Weird has to be introduced slowly but constantly. There just are some Weird things that you have to do in life and you just may enjoy them. It's only Weird the first time, and maybe the tenth time. But eventually Weird can be fun. Stepping past the car, the lock on the door pops. Kevin triggered the remote, the lights on the car flash, the locks pop. I shake my head thinking that's a bit of Automotive OCD. He does have a point, those remotes can sometimes have a hair trigger and lock or unlock the doors magically. Since Rack and I were standing next to the car, his reaction was "Oooh! Ride! CAR!". Not like it used to be when Car was Fear, so he is making progress. "No Rack, Show Me Walk! Walk!". Rack's ears drop back down somewhat, he turns and heads down the drive. Stopping to water the mailbox post and most of the yard boulders that line our parking space, we move into the street and down the block. There are no sidewalks on our street so flashlights are on the ready. If the pioneers in their sod homes had one of these flashlights, they would have thought their home was properly lit, but to us, they just make a pool of light to warn people of our presence while we walk in the street on our semi-quiet residential block. Nobody is out there but us two and Rack and something watching us from the shadows. Unlike in a big city, we don't have as many street lights as I would prefer. There are some rather dark areas. A full moon would help, and I'll schedule that for you every 28 or so days, just hang on a bit. We couldn't tell. Rack went on watering the allow wheel of the neighbor's SUV. "Stop that! The neighbor won't like you doing that, Boy!" I get a dopey grin from my dog and a chuckle out of Kevin. We walk on East toward the end of our neighborhood and toward the beach way over that way beyond. It gets darker. The neighbor's post lamps are out. They're home, I can see something playing on their TV through the sheers and the open blinds. We're being barked at from inside. I'm buzzed slightly overhead by a blue grey bird that lands on the wire. Seeing a bird on the wire about the size of a young beagle watching us, I'm amused. Our neighborhood has its Little Blue Heron back. "Amazing how loud those wings are when they fly just a few feet overhead!" "I guess he didn't like us getting too close." Rack begins to do his dance. I ready the plastic bags. Sorry, Bird, I can't stay to talk, it's going to rain soon and I have to get going after I pick this up. The Little Blue Heron flies from his perch on top of the port-a-potty on the construction site. I pick up Rack's port-a-potty in a brown plastic bag and wipe a rain drop from my brow. It's going to rain again. 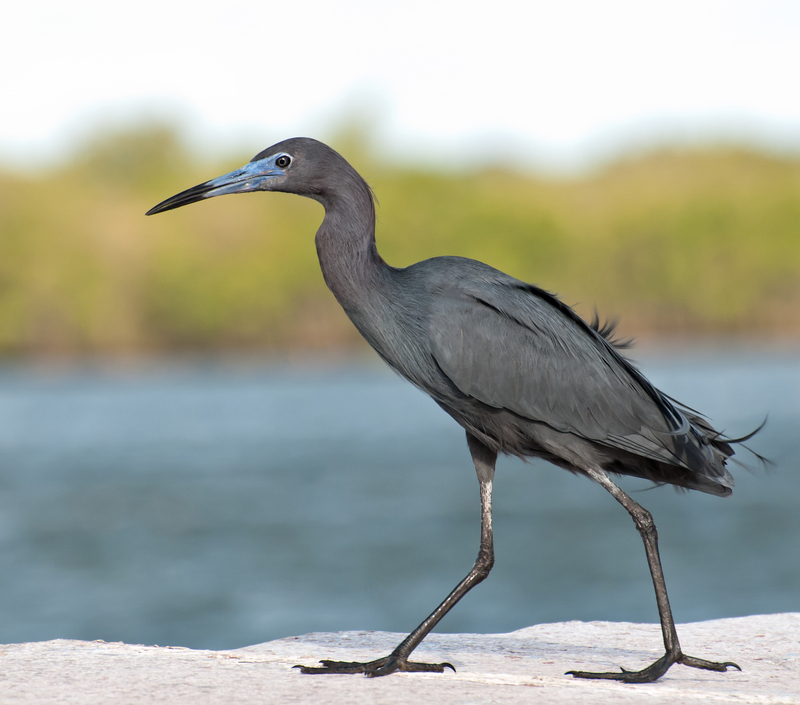 Welcome to the Wet Season, Mr Little Blue Heron.